Summary: Researchers have identified a link between paternally inherited variants in some noncoding segments of genes and an increased autism risk in subsequent offspring. A new study has identified an association between paternally-inherited rare structural variants in noncoding segments of genes and the development of autism spectrum disorder (ASD). The study, funded in part by the National Institute of Mental Health (NIMH) and published in Science, adds to a growing body of research describing genetic contributors to ASD. ASD is a developmental disorder that affects communication and behavior. While the exact causes of ASD are unknown, researchers have identified a number of genes associated with the development of ASD. Many studies have focused on examining the inheritance of, or mutations in, portions of genes that code for the creation of proteins or other molecular products. But these new findings suggest that rare, inherited structural differences in the noncoding portions of genes also contribute to ASD. The researchers examined the contribution of structural variants in noncoding regions of DNA called cis-regulatory elements (CRE-SVs) to ASD. These elements control the expression of genes. The researchers sequenced the genomes of 829 families, which included 880 individuals with ASD, 630 individuals without ASD, and their parents. Participants with genetic mutations that are already well-established risk factors for ASD were not included in this study. In this way, the researchers were able to focus on identifying noncoding inherited genetic variants that might be associated with ASD. The researchers identified structural variations in coding and noncoding portions of DNA, and they examined the inheritance of these genetic elements from parents to their offspring. Their research revealed deletions in protein-coding areas of genes were transmitted more often from parents to offspring with autism than from parents to offspring without autism. They also found that CRE-SVs were transmitted more often from fathers to offspring with autism then from fathers to offspring without autism. Inheritance of maternal CRE-SVs were not associated with ASD in offspring. 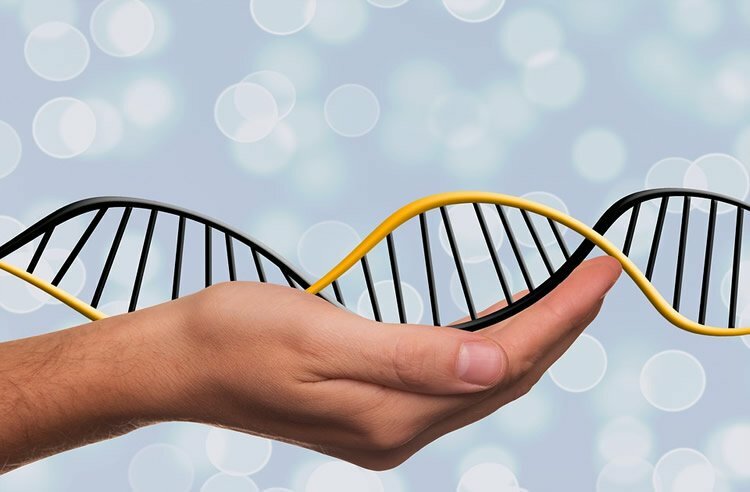 Although the researchers found spontaneous (i.e., non-inherited) genetic mutations in the coding regions of offspring’s DNA, no spontaneous CRE-SV mutations in cases were found. Spontaneous mutations to coding regions contribute in 5.1 percent of autism cases. The paternal origin of CRE-SVs associated with autism contrasts with what would be expected based on simpler genetic models of autism which suggest that inherited genetic risk factors for autism originate predominantly from mothers. Rare inherited cis-regulatory components contribute in 0.77 percent of autism cases. NeuroscienceNews.com image is in the public domain. “The paternal origin effect that we see for CRE-SVs suggests that the inherited genetic contribution from mothers and fathers may be qualitatively different,” said Dr. Sebat. The findings also provide a demonstration of the usefulness of SV analysis for identifying and understanding the genetic regulatory elements that influence risk for ASD. Original Research: Abstract for “Paternally inherited cis-regulatory structural variants are associated with autism” by Brandler WM, Antaki D, Gujral M, Kleiber ML, Whitney J, Maile MS, Hong O, Chapman TR, Tan S, Tandon P, Pang T, Tang SC, Vaux KK, Yang Y, Harrington E, Juul S, Turner DJ, Thiruvahindrapuram B, Kaur G, Wang Z, Kingsmore SF, Gleeson JG, Bisson D, Kakaradov B, Telenti A, Venter JC, Corominas R, Toma C, Cormand B, Rueda I, Guijarro S, Messer KS, Nievergelt CM, Arranz MJ, Courchesne E, Pierce K, Muotri AR, Iakoucheva LM, Hervas A, Scherer SW, Corsello C, and Sebat J. in Science. Published May 17 2018. NIH/NIMH “Inherited Variations in Noncoding Sections of DNA Associated with Autism.” NeuroscienceNews. NeuroscienceNews, 1 June 2018. NIH/NIMH “Inherited Variations in Noncoding Sections of DNA Associated with Autism.” http://neurosciencenews.com/autism-genetics-9213/ (accessed June 1, 2018). The genetic basis of autism spectrum disorder (ASD) is known to consist of contributions from de novo mutations in variant-intolerant genes. We hypothesize that rare inherited structural variants in cis-regulatory elements (CRE-SVs) of these genes also contribute to ASD. We investigated this by assessing the evidence for natural selection and transmission distortion of CRE-SVs in whole genomes of 9274 subjects from 2600 families affected by ASD. In a discovery cohort of 829 families, structural variants were depleted within promoters and untranslated regions, and paternally inherited CRE-SVs were preferentially transmitted to affected offspring and not to their unaffected siblings. The association of paternal CRE-SVs was replicated in an independent sample of 1771 families. Our results suggest that rare inherited noncoding variants predispose children to ASD, with differing contributions from each parent.